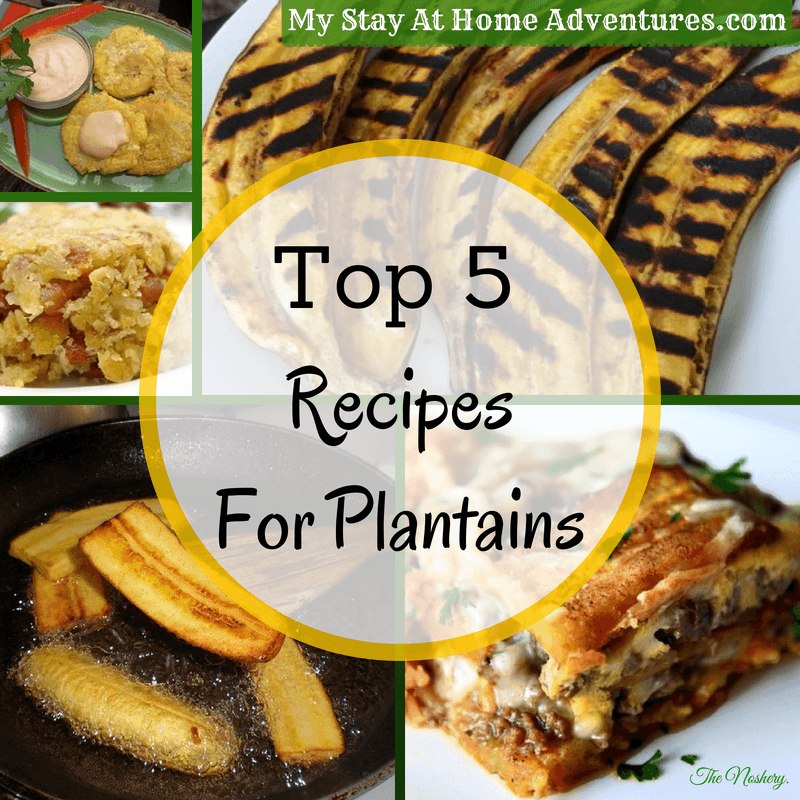 Top 5 Recipes For Plantains You Can Make Today! If you have read my blog before then you all know that I am Latina who loves Latin food. During the time I posted my weekly menu plans you noticed that we loved plantains in our family. If you are not familiar with what plantains are, you will today! Plantains are very inexpensive and you can create tons of recipes with it. Before I show you my top 5 recipes for plantains here’s a little information about plantains. Plantain can be created in many ways by boiling, mashing, frying, grilling or baking. Once you try it you will fall in love with the flavor. Plantains are found in most of the USA in the produce section of the grocery store. Plantains are members of the banana family. Plantains are very starchy and are considered the main side dish in the Caribbean. Why are they so popular? Because they are ready to eat no matter their stage of growth. Just in case you think you can just eat them raw, eh, no! They are not bananas. Though they look like bananas, plantains must be cooked before serve. Where can you find plantains? 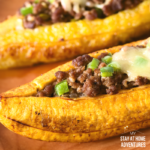 There are so many ways to cook plantains and you will find tons of plantain recipes for all stages of the plantain online. You will find recipes for green plantains, for ripe plantains, healthy recipes, not so, um, healthy recipe that tastes delicious. The point is that the recipes for plantains are endless! We purchase our plantains at Aldi, yes.. there! They cost as low as 15¢ each and you can feed your family many styles with $1.00! So if you are willing to try something new, and plantains are one, go for it. They are delicious, and they are affordable. Tostones – Easy to make and so good. Tostones is one of our favorites in our home. 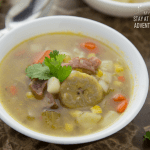 Mofongo – Smashed tostones with garlic, olive oil, and you can even add bacon! This is one of our traditional food in Puerto Rico. Fried plantains – Ripe plantains fried. 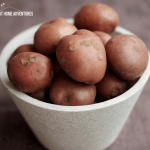 Another simple recipe that your kids would love. I make these for breakfast with fried eggs. Grilled Ripe Plantains – Grilled Plantains, yes, grilled and so delicious. We tried this once and loved the flavor. 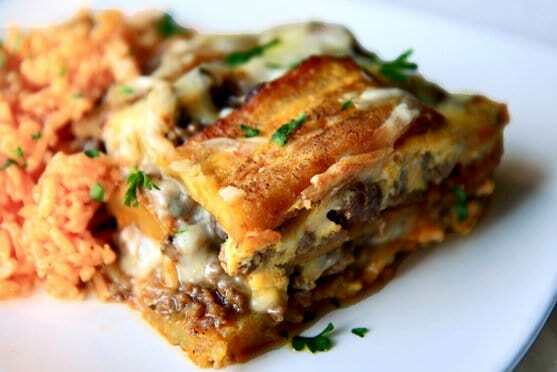 Sweet Plantain Lasagna – This is my personal favorite plantain recipe. So good. Brings back the memories. My grandmother used to make this for us. They are so many ways to cook plantains. Whether baked, fried, boiled, even smashed. If you have seen this “big banana” I suggest you pick up a few and give them a try you won’t be disappointed. I believe I read about Checkout 51 on your blog after you commented on mine and found some articles about it after searching. Anyways I was going to say that it seems to be working for me because it includes alot of stuff that I buy (such as produce and recently black beans and eggs as well). Not sure when I will get to that $20.00, but thanks for the info!